Earlier this week, I wrote an article about the way finding signs planted near the big water tower in Outwater Park. After some further research and some helpful hints from a friend who left a couple articles, I have decided to make an addendum to my original work. There is a better explanation of what the symbols on the ground mean. 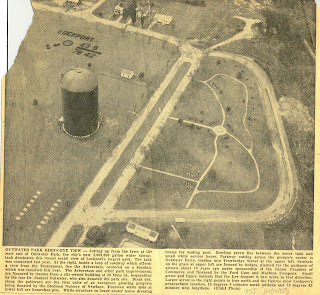 Robert Benton, an engineer at Harrison’s, and a member of the Lockport Junior Chamber of Commerce, formed the Lockport Jaycees Aviation Committee in November 1946. Serving as the committee chairman since it was formed, Benton was eager to promote an interest in aviation. He and the committee implemented a plan where a series of air marking signs would be placed in the area. The first part of the program was to paint some of those signs on the roofs of a couple of large industrial buildings in Lockport and Newfane. They also decided to plant a sign on the grounds of Outwater Park at its western end. This program earned the Lockport Jaycees a gold trophy from the New York State Junior Chamber of Commerce. President Wilbur Burns presented Benton with the Robinson Air Award at the annual convention in Elmira. Benton won the Jaycee Man of the Year Gold Key Award in June 1948 for his continuing work as “director of aviation research for the Jaycees,” and was a Robinson Air Award recipient for the second consecutive year. Additional parts of the program included the organization of an Air Scout Troop, and outreach programs with the elementary and junior high schools. According to an article in the Union-Sun & Journal dated January 30, 1948, the sign at Outwater Park was completed. The 20-foot letters were designed to be visible from 5,000 feet during the winter months. The Lockport Jaycees, along with the Ford Gum & Machine Company, sponsored the Parks Department to install the shrubbery at a cost of $500. The original markings stated the name of the community along with the latitude and longitude of the city. Separating the two numbers was a large arrow that pointed towards True North. The circle to the south with its corresponding arrow and number indicated the distance (2 miles) and direction of the nearest airport. 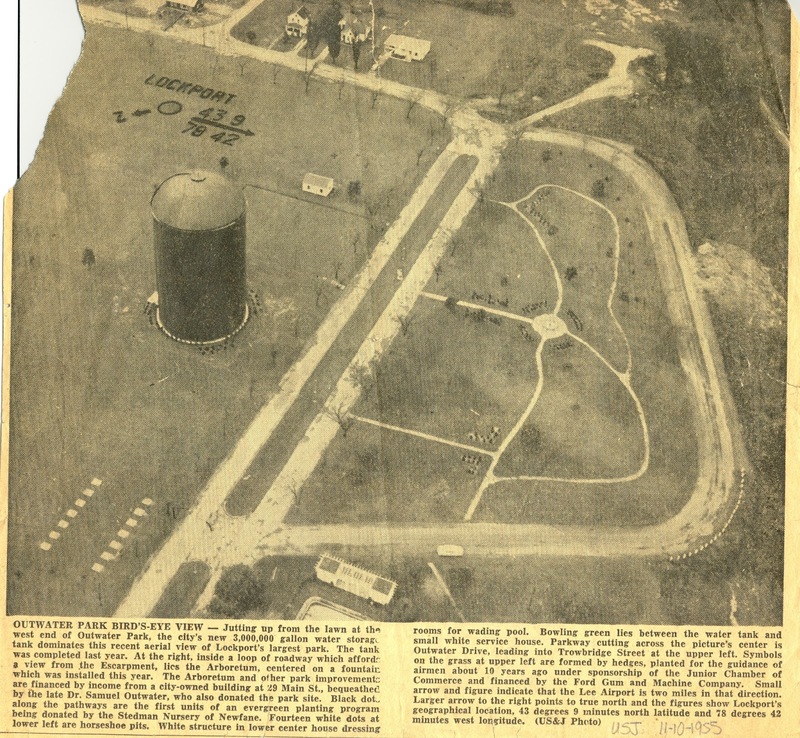 At that time, Lee Airport on Lincoln Avenue was the closest airfield. The single circle denoted that the airport was a Class 1 airfield. After the Lee Airport closed, the shrubs had to be altered to indicate the airport on Transit Road, south of the city was five miles distant. Apparently the minus sign for the longitude was never planted. I would guess that most people would assume the negative since they were above North America. Other members of the Aviation Committee for the Jaycees were: Curtis F. Wellington, Weldon A. Ernest, John C. Harris, Robert D. Fuller, Vinton E. Gregory, and William E. Watson. If there are any family members of these men around, I’m hoping that they may have some more information. I could not find anything in the Common Council or Parks Board minutes concerning the implementation of this plan. I looked from 1946 until 1950. There was nothing in the official record. With the advent of modern computers and GPS, the air-marking at Outwater Park is probably nearing the end of its usefulness. It is likely rapidly becoming obsolete. Still, I think it would be a fantastic thing to keep active. I’m not sure who upkeeps the bushes right now, but I urge them to keep this a part of their duties. Where else can you see messages from the air in Lockport? Craig Bacon loves learning more local lore each time he starts digging around in files. He’s still looking for that plane/helicopter ride over the area.